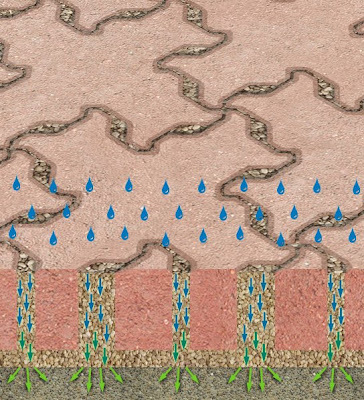 Permeable paving surfaces keep the pollutants in place in the soil or other material underlying the roadway, and allow water seepage to groundwater recharge while preventing the stream erosion problems. They capture the heavy metals that fall on them, preventing them from washing downstream and accumulating inadvertently in the environment. In the void spaces, naturally occurring micro-organisms digest car oils, leaving little but carbon dioxide and water; the oil ceases to exist as a pollutant. Rainwater infiltration its built-in stormwater management, is usually less than that of an impervious pavement with a separate stormwater management facility somewhere downstream. Also with permeable paving, the water literally gets sucked out of the road, providing a dry road when it rains. This technology is really a win/win for everyone, but from what I can tell it costs a bit more to maintain. Oh, and the news gets even better. I’ve learned that the Township of Langley is testing out permeable asphalt. Let’s hope that the tests are a success! Example of water flow through permeable asphalt.